When was the last time learning history was really fun ? 9 Tracks, Lyric Sheet Included ! Eli Whitney, Nathan Hale, P.T.Barnum, Roger Sherman, John Mason., and more. 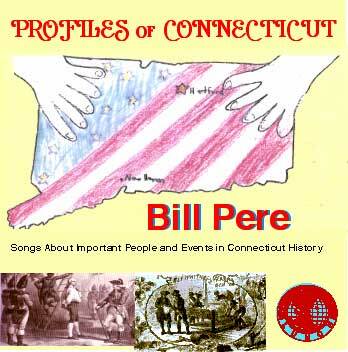 If you like lyrically rich songs that have meaning and emotion, check out Bill's AMERICANA series of CD's, which includes "Crest of a Wave" (maritime setting), "Cityscape" (urban setting), "Rural Mural" (rural setting) , "High School My School", (high school setting), and "College Collage" (college setting). You might also like "You'll See a Much Brighter Day is part of Bill spiritual collection, which also includes "New Day Coming Tomorrow"", and "Christmas Eve on the Poor Side of Town"